Another week of meal planning is here. Already. On Friday, my little sis and her family came up to visit. It was a great weekend of fun and relaxing with a teeny tiny break from real food, though I did still try to make good choices when available. In other news, Juicy may be on her way out in favor of my new VITAMIX!!! It is so very different, in both good and bad ways. I really do prefer actual juice over smoothies, but there is so much less waste with my new tool. It should reduce our fresh produce spending drastically. It is not only me that misses the pure Juicy kind of juice. Trevor has left several full glasses of green smoothie juice around the house. Hope I can get the consistency and taste right in the coming week. Tuesday: Chicken pot pie. Like most things, I modify this recipe. I make my own whole wheat crust, I use whole wheat flour in the filling, and I will be using chicken that cooked most of the day in the crock pot. Hands down, the very best whole chicken I have ever made! I will use the carcass to make stock overnight. Wednesday: Salad with black beans, quinoa, apples and almonds. I will try to find a suitable dressing to make, or it may end up being oil and balsamic vinegar. Thursday: Potato soup made in the Vitamix on Sunday with BLTA sandwiches. Friday: Grilled steak and veggie fajitas. I might try to make some corn tortillas from scratch. Emphasis on might given how the flour ones turned out. Saturday: We did not have dinner at home on Saturday last week, so I will be giving the quiches another go. Sunday: Lemon garlic salmon steamed in foil on the BBQ with brown rice and zucchini. Every week there seems to be something that makes it on menu that I cannot wait to cook up. This week it is the fajitas. 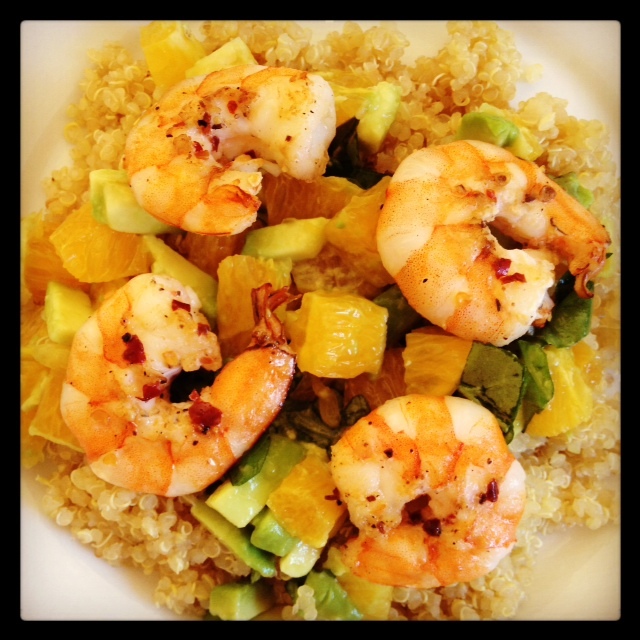 Last week it was the shrimp and quinoa with avocado and orange salsa. It was SO amazing. Lived up to the dreams that I had been dreaming about the dish. Both visually appealing, and terrific flavor! For those that are mothers, I hope you had a wonderful Mother’s Day, and that you were celebrated today! Enjoy your week! Thanks for the shout out! Glad you enjoy my steak recipe. Also great meal plan you have. Lots of blessings! Kelly, I found it on Pinterest. SO excited to try it out this week!